XQD card is a memory card format primarily developed for flash memory cards. It uses PCI Express as a data transfer interface. The format is targeted at high-definition camcorders and high-resolution digital cameras. It offers target read and write speeds from 1 Gbit/s (0.125 GB/s) to about 4 Gbit/s (0.5 GB/s) and storage capabilities beyond 2 TB. The cards are not backward compatible with CompactFlash or CFast cards. XQD and CFast were both designed as a replacement of the then-16-year-old (in 2010) CompactFlash standard. The format was first announced in November 2010 by SanDisk, Sony and Nikon, and was immediately picked up by the CompactFlash Association for development. The final specification was announced in December 2011. XQD version 2.0 was announced in June 2012, featuring support for PCI Express 3.0 with transfer rates up to 8 Gbit/s (1 GB/s). 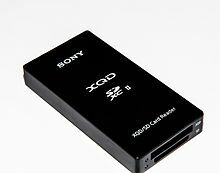 In January 2012, the first XQD card was announced by Sony, declaring a 1 Gbit/s read and write speed. In July 2012, Lexar announced plans to support the XQD format. In June 2017, Micron announced it was discontinuing the Lexar brand. In addition to Sony, as of August 2018, Nikon and Delkin are also manufacturing XQD cards. 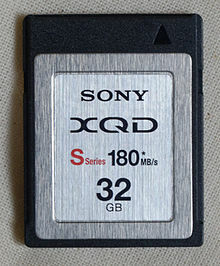 As of 2012, SanDisk and Kingston had not announced plans to produce XQD cards. Sony has said their broadcast camcorders (XDCAM and XDCAM EX) will support the XQD cards. For their broadcast products the XQD card will be classified as a secondary media as XQD is based around consumer technology. Nonetheless, the cards will support acquisition in the broadcast quality MPEG HD422 50 Mbit/s format. On 4 September 2013, Sony released the PXW-Z100, a 4K prosumer camera that records onto XQD cards. Nikon supports XQD cards in its newer high-end DSLR and mirrorless cameras: Nikon D4, Nikon D4s, Nikon D5, Nikon D850, Nikon D500 and Nikon Z6 & Nikon Z7. Phase One XF IQ4 camera system (three bodies) supports XQD cards. On 7 September 2016 the CFA announced the successor of XQD, CFexpress. This new standard uses the same form-factor and interface but uses the NVMe protocol for higher speeds, lower latencies and lower power consumption. ^ a b "CompactFlash Association readies next-gen XQD format, promises write speeds of 125 MB/s and up". Engadget. Retrieved 2012-09-19. ^ "Sandisk, Sony, and Nikon propose 500 Mbps memory card with more than 2 TB capacity". Engadget. Retrieved 2012-09-19. ^ "CompactFlash Association Announces XQD Card Format". Compactflash.org. 2011-12-07. Archived from the original on September 29, 2012. Retrieved 2012-09-19. ^ "The CompactFlash Association Invites Participation on XQDTM 2.0 — The CompactFlash Association". Compactflash.org. 2012-09-15. Archived from the original on September 19, 2012. Retrieved 2012-09-19. ^ "Sony Announces World's First XQD Memory Cards". Retrieved 2012-01-08. ^ "Lexar Announces Support for XQD Memory Card Specification". Retrieved 2012-07-12. ^ "R.I.P. Lexar Memory Cards". PetaPixel. 2017-06-27. Retrieved 2017-06-29. ^ "Sandisk, Lexar, Kingston not making new XQD cards". Retrieved 2012-01-25. ^ Shankland, Stephen (2012-01-13). "SanDisk on new XQD memory card format: 'Meh'". CNET. Retrieved 2012-01-25. ^ "Sony XDCAM Micro site". Sony. 2013-09-04. Retrieved 2013-09-03. ^ "Nikon announces first camera to use new XQD cards". arstechnica.com. 2012. Retrieved 2012-01-07. ^ "When There Is No Second Chance: The New Nikon FX-Format D4 Multi-Media Digital SLR is The Definitive Unification Of Speed And Precision" (Press release). Nikon Inc. 2012. Archived from the original on January 8, 2012. Retrieved 2012-01-07. ^ "Conquer the Dark: The New Nikon D5 DSLR Shatters Expectations for Thrilling New Levels of Low-Light Performance, Image Quality and Speed" (Press release). Nikon Inc. 2016. Archived from the original on January 7, 2016. Retrieved 2016-01-05. ^ "Pro Pedigree, DX Agility: The New Nikon D500 Establishes a New Era of DX-Format Performance" (Press release). Nikon Inc. 2016. Archived from the original on January 7, 2016. Retrieved 2016-01-05. ^ "XF IQ4 150MP Camera System". phaseone.com. 2018-08-28. Wikimedia Commons has media related to XQD. This page was last edited on 13 January 2019, at 19:28 (UTC).